Anyone who knows me knows my love affair with bubbly. So when I heard the Ritz-Carlton was hosting a sparkling wine flight on Wednesday evenings in the ~RITZ BAR~ (formerly the Cigar Bar), I was all over it like a straight guy watching two chicks make out. It's a kustom (with a k) spot for a date—you and your sweetie can cozy up in one of the leather chairs in the intimate seating areas and enjoy having most of the bar to yourself (unless there's a group of conventioneers or Japanese businessmen getting buzzed in there). 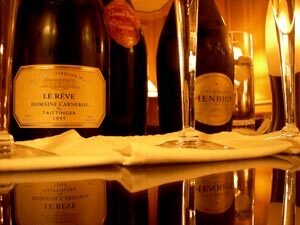 We had a sampling of three fantastic bubblies, including the slightly tropical Domaine Carneros by Taittinger, Le Reve, Carneros, 1999; Gosset, Grand Rose, Champagne, Brut, NV; and my favorite, the yeasty Henriot, Cuvee des Enchanteleurs, Champagne, Brut, 1995. Yup, I was feeling goooooooood. But check this out: you get to keep your champers company with a rotating trio of amuse bouches from the Dining Room's Ron Siegel, like sea urchin pannacotta with lobster, avocado, and Tahitian vanilla oil, in addition to a trio of dessert bites, like the scrumptious chocolate Manjari caramel cake with milk chocolate ice cream, five-spice foam, hazelnut dentelle, and Maldon salt. Uh, heaven. It reminded me of my favorite fleur de sel chocolate caramel at Michael Recchiuti. The whole experience was classy and rather decadent, all for $39. Another Wednesday boozy higher education option is at the friendly ~WILLIAM CROSS WINE MERCHANT~ on upper Polk Street. Every Wednesday evening, from 6pm-9pm, Steve Sherman enthusiastically leads a group of winos on a tasting through a country, a region, a style, or a single winery. I happily checked it out on an evening when he was showcasing wines he discovered during his most recent trip to Italy, mamma mia. The tastings hover around $15, and I recommend you get there at 6pm sharp if you want to snag a seat at the bar, otherwise you get to mill around with fellow wine drinkers on your feet. The tastings last until 9pm or so. Then you can wobble down the street for a bite to eat at Tablespoon, or the new Nicky's Pizzeria. There's also Yabbie's right next door. Coming up: this Wednesday, April 12, is Spanish wines; Wednesday, April 19, is Oregon wines.